In April of 1987 I began keeping a book of poems. The book is a marbled green variation of the classic composition notebook. Except the cover is stiff and inside you’ll find graph paper, not lined. I’ve kept it– treasured it–for twenty years. From time to time, I’ve added another poem to the collection. The journal–that’s what it really is–opens with two poems from 1985, but they are not the only thing the book holds. A yellowed copy of Stan Grossfeld’s Pulitzer prize winning photo of an Ethiopian mother and child in Wad Sharafin Camp in the Sudan from 1984. I’d cut it out of the Boston Globe when it was originally published. 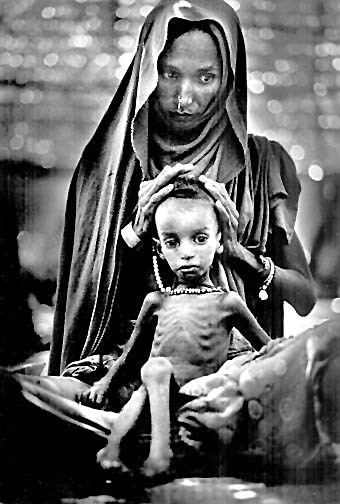 I consider the image to be the epitome of the Third World Madonna and Child. I also have a photocopy of the same newspaper clipping. The original has held up better. There’s a draft of a poem–or was it a song?–written in 1999 to a friend at LSU I’d lost and found and was losing again. Did I ever send it? Did I finish it? I have no idea. The draft itself is coarse sandpaper rough. I still hope to find her and look from time to time. Another clipping. 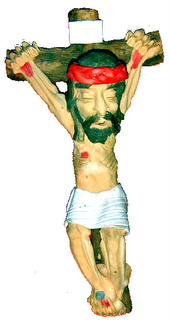 A photo cut from the National Catholic Reporter of a Peruvian Crucifix sculpted by Edilberto Merida. The Christ figure is rendered in a traditional indigenous form. The hands, feet and facial features are all oversized. Like the Grossfeld photo, this is a Christ of the poor. The last clipping is an article from the Sunday Globe from 1989 by David Nyhan on the growing numbers of refugees throughout the world. I’m pretty sure I kept it because the story frames the Grossfeld photo. After that a page left blank followed by two poems from 1985. I remember buying the book to hold a flurry of poems I found myself writing. The two from ’85 had probably been written on individual pieces of paper and saved. That was a time in my life when I would write as inspiration struck and present my poems as random gifts to friends and strangers. Twenty years later I begin this virtual book where I will endeavor to write from time to time as inspiration strikes. Here you’ll find links, clippings and musings of mine. Nothing fancy, just plain text notes.